The winning design will be sold in both Timbers and Pendleton stores. 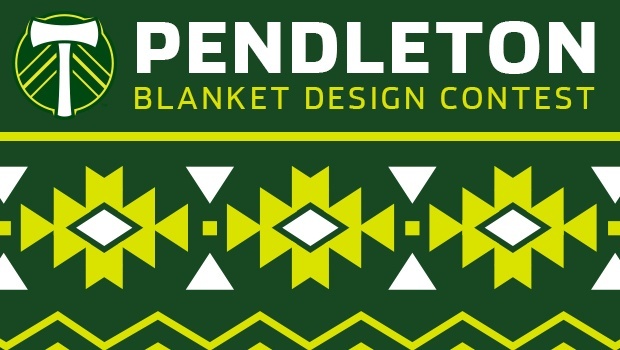 The Portland Timbers have partnered with the iconic Pendleton Woolen Mills to launch a special design contest where fans can create their own Timbers centric designed blanket, with the winning design being sold at both Timbers and Pendleton retail locations. Proceeds from the sale of this one-of-a-kind designed blanket will benefit the “Fields For All” initiative which helps build youth soccer fields and futsal courts each year in the greater Portland area. The contest will work in two parts. During the initial entry period, anyone can submit a design. From that initial pool of entries, two finalists will be selected and posted on the Timbers Facebook page, with voting beginning on Monday, June 8, 2015 and ending on Friday, June 12, 2015. The design with the most votes will be created into a blanket. Submit electronic form to: pendletonblanket@timbers.com. Please enter “Pendleton Blanket Promotion” in the subject line. Electronic entries must be no larger than 8 MBs and be submitted as a pdf, jpeg, gif or eps file. All entries must be received by Friday, May 29 by 5 p.m. PST. In addition to having your artwork replicated on a Pendleton Woolen Mills blanket, the winner will also receive four (4) tickets to a Timbers match, four (4) pre-game VIP hospitality passes, a $250 Pendleton Woolen Mills Gift Card, and a commemorative version of the Pendleton blanket that he/she designed. All entries will be judged based on originality, creativity and the ability to express the Portland Timbers brand in a positive manner. Permissible methods to create the design include, but are not be limited to, pencil, inks, paints, crayons, and computer-aided designs. The artwork will be scanned, so 3-D elements such as fabric, clay, textures, etc., are not appropriate. Due to weaving limitations, the design can only have (2) two colors in a horizontal line. Up to 12 colors can be used in one design. (See entry form for a visual example). Founded in 1863, Pendleton has been a family-owned business for 150 years, and for 104 of those years, they’ve been weaving world class woolens in their Northwest Mills. Today the company owns and operates seven (7) facilities, manages 75 Pendleton retail stores and publishes apparel and home direct mail catalogs.